The latest addition to San Francisco Salt Company's line of gourmet specialty salts features the distinct flavors of whiskey, smoke and sea salt and was unveiled earlier this week. SAN FRANCISCO, July 1, 2016 /PRNewswire/ -- San Francisco Salt Company—one of the largest importers of specialty salts in the country—has partnered with Irish brand Oriel Sea Salt to introduce a unique Whiskey Smoked Irish Sea Salt to its lineup of gourmet chef salts. The launch took place at the Summer Fancy Food Show from June 26-28, 2016 at the Javits Center in New York City. The creation of Whiskey Smoked Irish Sea Salt begins with smoking 90-year-old Nicaraguan oak kegs which held Teeling's finest Irish whiskey during its last 10 years of aging. The smoking takes place just hours after the kegs are emptied. This process ensures that they retain their rich whiskey and oak aroma, which are then subtly infused into Oriel Kiln-Dried Mineral Sea Salt. Oriel's salt is renowned for being naturally lower in sodium, having higher mineral content, and embodying a powerful taste that allows chefs and food lovers to use up to 25% less with the same kick of flavor. It is a naturally free-flowing fine grain smoked sea salt which blends rapidly in recipes. Once smoked, it delivers a rich, smoky flavor that can be sprinkled onto meat or used on burgers, though the culinary possibilities are endless and are only limited by one's creativity and imagination. "Until Oriel contacted us, Irish Sea Salt was not really on our radar, so we were instantly intrigued. When they told us about their Teeling Whiskey Smoked Sea Salt, we knew we had to try it," says San Francisco Salt Company's President Lee Williamson. "It combines three fantastic flavors—whiskey, smoked oak barrels, and sea salt—which come together in a surprisingly harmonious and palate-pleasing way. Powerful and smooth is a huge understatement." 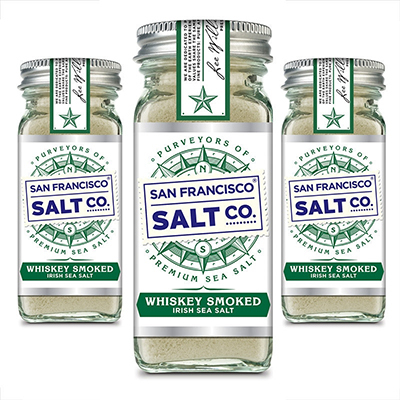 Like all San Francisco Salt Company products, the Whiskey Salt is available in bulk packs for restaurants, hotels, bars and other volume customers as well as three retail-sized package options: 4-ounce glass shaker bottles, 5-ounce stackable shakers, and 8-ounce glass chef's jars with wooden scoop. Launched in 2002, the San Francisco Salt Company was the founders' entrepreneurial dream and embodies his principals of quality, value, and customer service. They carefully select only the best quality salts from suppliers around the globe for their taste, texture, and appearance. For more information, please visit //www.sfsalt.com/ or find the brand on Facebook, Twitter, and Instagram.